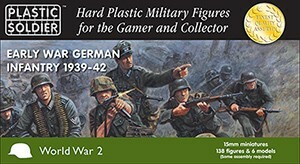 Company sized 15mm Early War German Infantry 1939-42 box set. Contains: 138 figures, including 3 x 50mm mortar teams and 3 x anti tank rifle teams. All you need to build a 3 platoon company (including company HQ).